How much does it cost to travel to Hvar? 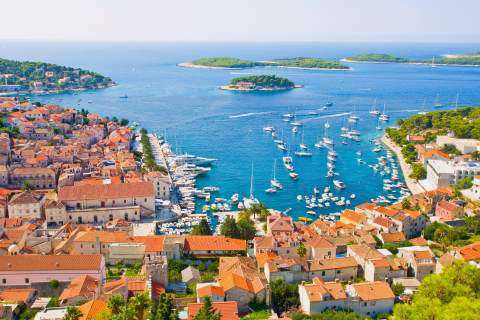 How much money will you need in Hvar? kn619 ($93) is the average daily price for traveling in Hvar. The average price of food for one day is kn231 ($35). The average price of a hotel for a couple is kn456 ($69). Additional pricing is in the table below. These average travel prices have been collected from other travelers to help you plan your own travel budget. Hvar is a Croatian island full of mountains, vegetation, beaches, vineyards, shops, restaurants, and also people! Hvar Town is the main city on the island, but there are many other small villages throughout. The best time to visit Hvar is between May and September, although keep in mind it can get busy during this period. One of the most beautiful town squares in all of Croatia is in Hvar Town. The whole town was developed around this square. Near the square is a hill with a fortress, which is a great walk to take, as the views of the town and sea from there are marvelous. Within the fortress is a small shop where you can purchase drinks and small snacks to enjoy while taking in the view. At the end of the town square is the Cathedral of St. Stephan, which was built during the 17th century. The bell tower of the cathedral is four stories tall and each floor is decorated differently, becoming more elaborate the higher up you go. On Hvar Island are many towns and villages. Hvar Town is the main town and it is located on the southwest shore of the island. Another town on the island is Stari Grad, which is more central, near a water inlet northwest of Hvar Town. Jelsa is another town on the island, which is located in the middle of the north coast. Hvar Island is part of the Middle Dalmatia Islands. There are many islands surrounding Hvar Island and great day activities consist of visiting these islands and exploring the white sand beaches, or finding hiking trails. The Pakleni Islands are nearby and you can rent a boat to go explore this area on your own. There are also tours and water taxis that can take you if you don't feel comfortable operating a boat. Be sure to bring some food and wine, as it is a beautiful place to have a picnic for the day. On Bisevo Island, you can find the Blue Cave. This is an extraordinary activity where you can swim in the blue water within the cave. Atlantis Marine is a great company that can take you to the islands. Another company that offers tours to the Blue Cave and other hidden beaches around Hvar is Vagabundo Excursions. On the beaches in Hvar, there are many companies that offer kite surfing, wind surfing, diving, snorkeling, and bicycle rentals. This is a great activity for your visit in Hvar as the water is extremely clear and blue. At night, a great place to go dancing is at Carpe Diem. It is located on an island not far off the shore of Hvar and there are boats that will take you there from their dock in Hvar. The Golden Shell is a popular restaurant just off of the main square in Hvar Town. You will dine outside beneath a vine roof and most likely be offered to sip on the local brew, which is fig brandy. This restaurant serves the national dish of Croatia, which is rabbit in fig sauce, but another popular menu item here is the rabbit with potatoes and peanut sauce. For great pizzas and burgers, go to Gustico, which is inside the Youth Hostel Villa Marija. They also offer free delivery! In the town of Stari Grad, the best restaurant, which is located on the waterfront, is Eremitaz. This restaurant has a rustic feel and serves delicious food and wine. To get to Hvar Town, you will need to take a catamaran from Split. There are two companies that offer this service: Jadrolinija and Krilo. This is about a one-hour journey and costs about 70kn. If you are heading to Stari Grad, there are many ferries that leave from Split for about 47kn per person. This journey takes about two hours. To get to Jelsa, there are catamarans that leave from Split and this takes about an hour and a half. Dalmatia Express is a water taxi service that can bring you to Hvar Island from Split as well. When arriving in either of the three towns mentioned above, there are buses that can take you to the town center or to a different town on the island. There are taxis that will be waiting near the port; however, these drivers will overcharge you so its best to just take a bus. Another option for getting around the island is to rent a car or a motor scooter. It is not too expensive to do either of these things, however, take caution when driving on the island, as there can be steep roads that are unevenly paved.